WARNING: This medication should not be given to a patient without their knowledge. Do not take this medication if you are under the influence of alcohol or have drunk alcohol in the last 12 hours. USES: This medication is used along with counseling and support to treat alcoholism. 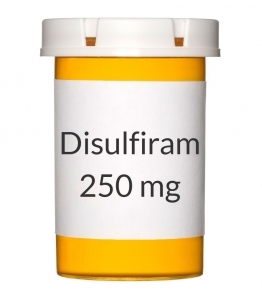 Disulfiram works by blocking the processing of alcohol in the body. This causes you to have a bad reaction when you drink alcohol. HOW TO USE: See also Precautions section. Take this medication by mouth with or without food, usually once daily in the morning or as directed by your doctor. If this medication causes drowsiness, take it at bedtime. Dosage is based on your medical condition and response to therapy. The maximum recommended daily dose is 500 milligrams. Use this medication regularly to get the most benefit from it. To help you remember, take it at the same time each day. SIDE EFFECTS: Drowsiness, tiredness, headache, acne, and metallic/garlic-like taste in the mouth may occur as your body gets used to the medication. If any of these effects persist or worsen, tell your doctor or pharmacist promptly. Remember that your doctor has prescribed this medication because he or she has judged that the benefit to you is greater than the risk of side effects. Many people using this medication do not have serious side effects. Tell your doctor immediately if any of these unlikely but serious side effects occur: decreased sexual ability, vision changes, numbness/tingling of arms/legs, muscle weakness, mental/mood changes (e.g. agitation, extreme excitement/confusion), seizures, confusion. This drug may infrequently cause serious (rarely fatal) liver disease. If you notice any of the following unlikely but very serious side effects, tell your doctor immediately: persistent nausea/vomiting, severe stomach/abdominal pain, dark urine, yellowing eyes/skin. A very serious allergic reaction to this drug is rare. However, seek immediate medical attention if you notice any symptoms of a serious allergic reaction, including: rash, itching/swelling (especially of the face/tongue/throat), severe dizziness, trouble breathing. This is not a complete list of possible side effects. If you notice other effects not listed above, contact your doctor or pharmacist. In the US - Call your doctor for medical advice about side effects. You may report side effects to FDA at 1-800-FDA-1088. In Canada - Call your doctor for medical advice about side effects. You may report side effects to Health Canada at 1-866-234-2345. PRECAUTIONS: Before taking disulfiram, tell your doctor or pharmacist if you are allergic to it; or to thiuram or thiuram-related chemicals (found in pesticides and rubber); or if you have any other allergies. This product may contain inactive ingredients, which can cause allergic reactions or other problems. Talk to your pharmacist for more details. This medication should not be used if you have certain medical conditions. Before using this medicine, consult your doctor or pharmacist if you have: severe heart/blood vessel disease (e.g., coronary artery disease), certain mental/mood condition (psychosis). Before using this medication, tell your doctor or pharmacist your medical history, especially of: diabetes, underactive thyroid (hypothyroidism), brain disorders (e.g., seizures, brain damage), kidney disease, liver disease, personal or family history of regular use/abuse of drugs. Avoid all alcoholic beverages or alcohol-containing products/foods (e.g., cough and cold syrups, mouthwash, aftershave, sauces, vinegars) while taking this medication and for 2 weeks after stopping the medication. Check all product labels carefully to make sure that there is no alcohol in the product. Using alcohol, even a small amount, while taking this medication can lead to a reaction that may include flushing, throbbing headache, breathing problems (e.g., shortness of breath, fast breathing), nausea, vomiting, dizziness, extreme tiredness, fainting, fast/irregular heartbeat, or blurred vision. These symptoms can last from 30 minutes to several hours. Tell your doctor immediately if these symptoms occur, especially if they persist or worsen. A more serious reaction with this medication and alcohol may include trouble breathing, seizures, loss of consciousness, chest/jaw/left arm pain. Seek immediate medical attention if you have these symptoms. During pregnancy, this medication should be used only when clearly needed. Discuss the risks and benefits with your doctor. It is unknown if this drug passes into breast milk. Consult your doctor before breast-feeding. DRUG INTERACTIONS: Your doctor or pharmacist may already be aware of any possible drug interactions and may be monitoring you for them. Do not start, stop, or change the dosage of any medicine before checking with your doctor or pharmacist first. This drug should not be used with the following medications because very serious interactions may occur: alcohol-containing products (e.g., cough and cold syrups, aftershave), amprenavir oral solution, metronidazole. If you are currently using any of these medications listed above, tell your doctor or pharmacist before starting disulfiram. Before using this medication, tell your doctor or pharmacist of all prescription and nonprescription/herbal products you may use, especially of: amitriptyline, "blood thinners" (e.g., warfarin), certain medications for seizures (e.g., hydantoins such as phenytoin/fosphenytoin), isoniazid, theophylline. This medication can increase the side effects of caffeine. Avoid drinking large amounts of beverages containing caffeine (coffee, tea, colas) or eating large amounts of chocolate. This medication may interfere with certain laboratory tests (including urine VMA/HVA tests), possibly causing false test results. Make sure laboratory personnel and all your doctors know you use this drug. This document does not contain all possible interactions. Therefore, before using this product, tell your doctor or pharmacist of all the products you use. Keep a list of all your medications with you, and share the list with your doctor and pharmacist. OVERDOSE: If overdose is suspected, contact your local poison control center or emergency room immediately. US residents can call the US National Poison Hotline at 1-800-222-1222. Canada residents can call a provincial poison control center. Symptoms of overdose may include: vomiting, drowsiness, loss of coordination, loss of consciousness. NOTES: Do not share this medication with others. Laboratory and/or medical tests (e.g., liver function test, complete blood count) should be performed periodically to monitor your progress or check for side effects. Consult your doctor for more details. It is recommended that you carry an identification card stating that you are taking this medication and describing the possible reaction that may occur if you consume alcohol.